Blueberry-Peach Pie - Guest Post! space....or something to that effect. 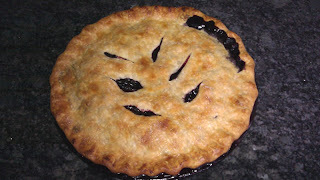 My blueberry-peach pie resulted from a conversation, a craving, a compromise, and a challenge. And it has changed my life in several small ways. Welcome to our continuing series, Scenes from the Secret Recipe Club. In this month's episode, we serve a heaping helping of Chicken Tikka Masala, brought to you by Melissa of Fried Ice and Donut Holes. Melissa is a teacher by profession, and a cook and baker by passion. When you visit her blog, be sure to check out her About section to find out why "fried ice and donut holes" came to be a warning to behave (it's kinda cute!). Melissa has a very eclectic taste in food, as well as I ... and her delicious recipes showcase it! This made selecting just one quite difficult. Should I make a batch of Indian Spiced Cream of Tomato Soup with Couscous? But that Roasted Tomato and Basil Risotto looks so divine! Or maybe her version of Chocolate Peanut Butter Cups instead? But the Chicken Tikka Masala truly beckoned me. 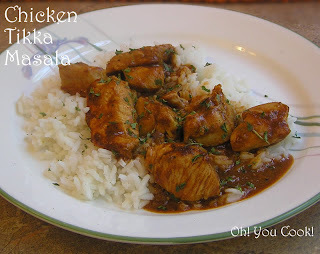 I've had Tikka Masala at the local Indian restaurant several times, but never got around to making it myself. Now there are no more excuses!